Bead Bai by Sultan Somjee offers an engaging insight into the experiences of the Satpanth Ismaili community in East Africa from late 19th century onwards. The early entrepreneurs of this unique religious group developed a network of family stores that spanned across the geography of East Africa. The petty traders set off for the interior areas, spanning from the East Coast of Africa to the Congo region, with foot caravans, carrying goods for barter such as blankets, cloth, food stuff and building material. An ethnographer by profession, Sultan Somjee particularly describes the community’s involvement in the trade of beads of ‘different colours, luster, sizes and shapes’ with ethnic tribes (p. iii). Early 20th century, Satpanth women began to arrive on the East African shore as child brides, and settled to their new lives in urban as well as rural areas. Often, the merchant’s wife, mother and daughter would work at the family store in the early days, handling the bead stocks, mainly imported from Czechoslovakia. Somjee credits these women with enabling the flow of beads between the traders and the ethnic tribes, particularly the pastoral Maasai. They therefore came to be known as ‘bead bais’. In due time, an entire street in commercial Nairobi came to be known as Moti Bazaar or Bead Bazaar (p. iv). The fascinating story of the bead bais has however remained largely unheard outside the Satpanth community. Like the spangled kanga, the wild hen of savannah grasslands, my story nods its head up and down. You wonder what corner it will go to now. Where will it hide? Where will it come to rest? But kanga’s head never stops bobbing. My tale meanders along the story path bouncing up and down like the kanga’s head. When I was young, that’s how stories were told. Like the bird called kanga crisscrossing paths of time, nodding at each step, drawing past to present and pushing back present to past (p. 189). As Sakina reaches puberty, she becomes increasingly conscious of the restrictions placed upon her in terms of what she should wear, where she can visit and with whom she can be seen talking. The concept of family honour, associated with the concept of a dependent woman or a ‘mothaj’ who is a burden on her family and community, is central to the text. Sakina’s father insists that her marriage takes place, worrying that she will be ‘a mothaj’ if she is not married off soon. Somjee deftly presents a patriarchal social milieu wherein the ideology of wifehood motherhood is a dominant factor in defining the Satpanth woman’s self-identity. Sakina is positively influenced by her independent minded stepmother, Ma Gor Bai who has lived as an outcaste Satpanth widow in Zanzibar before her marriage to Sakina’s father, a much older man. At the age of sixteen, Gor Bai set sail from the port of Diu in search of a husband who had not returned from Africa. Determined to defy her destiny as an unwanted ‘polluted’ widow, and to avoid the scorn directed towards them as ‘mothaj’ by reluctant well-wishers, she stays back in Zanzibar. Africa, therefore, became ‘the land of the second chance’ for such ostracized women. Somjee draws our attention to the historically verified presence of Indian prostitutes in Africa, through his sympathetic portrayal of Meethi Bai, the proprietor of ‘Indian lodge’ which is a brothel frequented by labourers brought in to construct the Ugandan Railway. Meethi Bai’s lodge becomes a second home to the ‘three Bombay ladies’ who escape from ‘kothas’ in Mumbai, in search for a better life. Sakina is married at 16, to Haiderali Devji, who is just two years older than her. She moves out of the segregated Asian section of Nairobi where she has lived all her life into rural Kenya. She finds relief from mundane domestic chores in the two hours every afternoon that she spends with the Maasai elder Ole Lekakeny (‘the storyteller of the Savannah’, p. 310) who teaches her the Maasai art of working with beads. She is fascinated by the emankeeki, which is a circular beaded neck-to-chest decoration that Maasai married women wear. Ole Lekakey assures her, ‘You will learn how to bead the bead in your fingers and let the colours sing to your eyes. You will know the Maasai art when you start beading the sky’ (p. 293). He tutors her on designing her own emankeeki which ‘displays meticulously worked out patterns according to Maasai aesthetic schemes that relate to patterns in nature such as of clouds, animal coats, trees, rocks and mountains (p. 134). The novel ends on a positive note with Sakina asserting her agency made possible through self-realization closely connected to her artistic integrity. Somjee’s novel not only offers a rare perspective into the gendered experiences of ‘passenger’ women who migrated from the Indian subcontinent to colonial British East Africa, but it also poetically presents a unique cultural synthesis of African and Asian art forms. Somjee lyrically renders his intimate knowledge of indigenous cultural and artistic practices in combination with his keen interest in history of trade between Satpanth–Khoja traders and their indigenous Kenyan customers. Mala Pandurang is the Head of the Department of English, Dr. BMN Collage, Matunga, Mumbai. Sakina is an embroidery artist growing up in the shanty town of Indian Nairobi, a railroad settlement in British East Africa in the early 1900s. At home there are many storytellers like her stepmother, grandfather and uncle whose stories blend like a tapestry of India and East Africa that flare her child’s imagination. In her tormented married life, while becoming a woman, Sakina finds comfort in the art of the beadwork of the Maasai. Who were these Bead Bais of East Africa who came to Canada as grandmothers? Early Asian African dukas in East Africa. 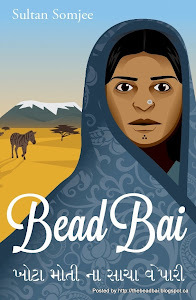 Bead Bai is the story of the woman behind the store front. The journey to writing the memoir begins by becoming aware of the Material World that people build around them over the years. I live in Burnaby, Canada. I walk the path at crossroads of faiths and cultures, listening to stories embedded in artefacts and photographs. And I write. While writing this book I listened to many storytellers over a period of nine years. In the book I quote one Canadian storyteller called Thomas King. He is an Aboriginal storyteller. This is what he says: "The truth about stories is that that’s all we are."